This was supposed to be January’s Post, but I didn’t get around to it. There will be a February post as well…sometime in April, the way things are going. The most Jedi way to handle this situation. 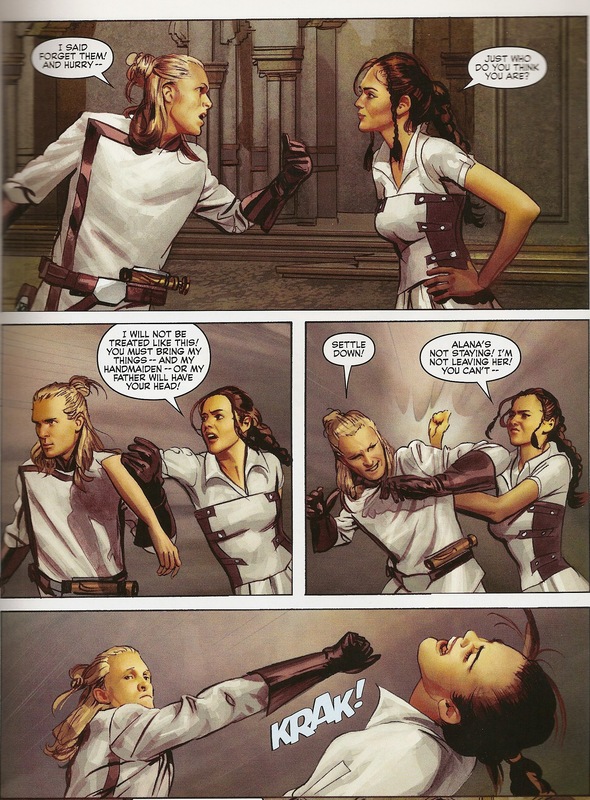 I’ve been meaning to address this scene, from Issue #2 of The Star Wars, but I was waiting for it to get addressed. I’m waiting for Annikin to have to, you know, apologize for knocking a Princess the hell out. Leia does start to complain to Luke Skywalker in the following issue, but is cut off by the death of her father at imperial hands. That’s where it’s been left, and both characters seem as though their fine with it. We even see the obligatory romance blossoming between the two, for which this event must be the obligatory hair-pulling. The other reason I haven’t gone after it with the vigor of say, this blogger, is because this is a rough draft. This is the part of the creative process when you just kind of throw things around and see what sticks. This is, thankfully, something that didn’t stick around. The actual princess Leia has far more spine than this silly little girl getting all upset about her lack of entourage (she’s more like Vespa from Spaceballs, really), and neither Luke nor Han ever lay a finger on her, not because they’re so fond of her (“no reward is worth this”) because it’s not necessary to beat a woman in order to awaken her to danger. My guess is the contrary cliche worked its way through Lucas’ noggin onto the rough draft page, where it was excised as a cheap piece of tension that didn’t fit either character (both of whom largely ended up being other characters). That’s what I keep seeing as this rough draft screenplay comes to life: odd scenes that are supposed to ramp up the drama but really lead nowhere. Take the death of Kane Starkiller, which was obviously supposed to be an emotional moment for both General Luke Skywalker and Annikin “Roofie” Starkiller, but it doesn’t accomplish anything except to get the good guys off-planet, which the plot was directing them to accomplish anyway. And it’s just an odd story arc for Kane: he loses his younger son, drives the elder one off to Aquilae to hand him off for Jedi Finishing, announces he’s dying, exits stage left to run into Frog Han Solo, and then dies so that the royal princes can hibernate through space, because character Whatall McWhichever says that’s what has to happen. The whole thing’s a Rube Goldberg plot apparatus, and it involves nothing but people talking. Which brings me to Frog Han Solo. He’s mentioned two or three times, but doesn’t appear until Issue #4. You might therefore think that contacting him and/or getting him to put his froggy skills on the side of righteousness will present some kind of challenge for the new Skywalker/Starkiller/Toothless Leia team (plus the droids), but it doesn’t. Luke literally steps off his sand speeder, sniffs around for a minute, and runs into this hulking (get it?) green behemoth, who lets loose with the exact same kind of line that could have come from Kane or Annikin or Whitsun even the former, now crispy King of Aquilae. This is another problem with rough drafts: the characters are raw, and barely distinguishable from each other. Solo sounds like Skywalker sounds like both of the Starkillers sounds like everyone else. One starts to wonder (as Lucas undoubtedly started to wonder) how many of these characters really were necessary. And he started to throw in some disparate motivations (getting paid, saving the princess, stopping the Death Star, seeking a reckoning now that you’ve passed on the Jedi spark). Vader with a face is not as weird as it might have been, now that we’ve seen Darth Maul and Darth Tyrannus and so on. The twist is that Darth Vader doesn’t mean “The particular Dark Lord of the Sith whose Sithy name is Vader”, but “a man of the Vader family, who’s first name is Darth.” Vader is just a power-hungry imperial general. Which is fine, but raises a few questions. Like, why is he not a Sith, since “Sith Knights” are the mortal enemy of “Jedi-Bendu” and Vader follows an actual Sith, Prince Valorum, around like a lovesick schoolboy? Like, is the Vader suit we know and love really meant to be taken as the standard Imperial General’s uniform? Like, WHAT IS THE DEAL WITH HIS EYE? At this point, that’s really all I’m reading for. Previous Previous post: The 27 rules of suits.